BREAKING: #BlackLivesMatter Activists Want Donald Trump Dead! BLACK ACTIVISTS WANT DONALD TRUMP DEAD! This threat was posted on Twitter by Swole Pocket Sarah Tuesday evening. 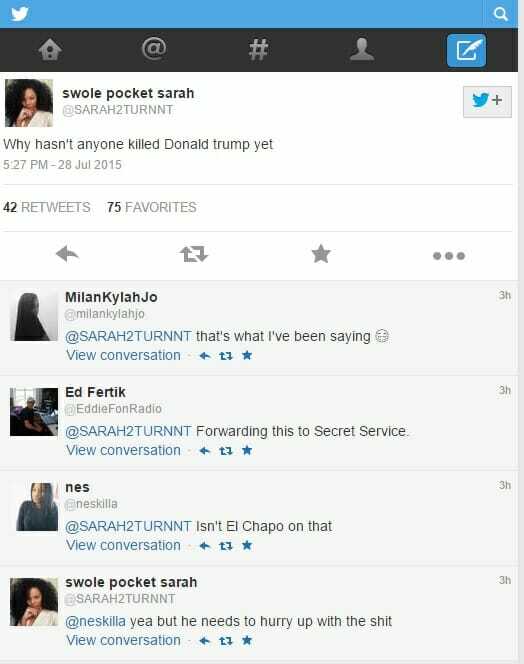 Notice: “Swole Pocket Sarah” and “Nes” say “El Chapo” is on it. We’re seeing more and more of these Trump death fantasies on Twitter. If Sharknado brutally killed Trump Twitter would implode.